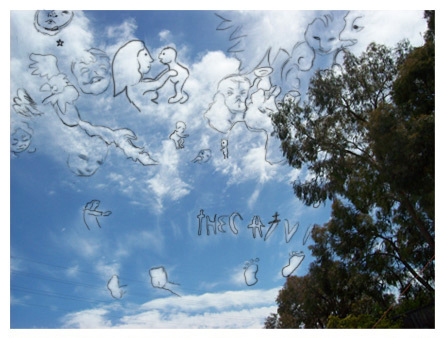 In last September’s The 5th Belongs to Calvin post, I showed Calvin’s name spelled in the clouds. This is the follow-up to that post… almost a year later. Yes, it had been sitting as a draft for almost that long. And, yes, I know I can be slow sometimes. But on this sleepless night, I’m finally sharing :). You can see the letters of Calvin’s name in this photo, too, but what’s particularly special about this one is that there are other images that revealed themselves in these clouds as Louie and I outlined their shapes. What we found include angels, a cross, a phoenix, a mother holding her baby, and babies—lots of babies, and even a couple of babies whose faces I recognized. I know this seems kind of strange, but is it any “stranger” than seeing C-A-L-V-I-N in the sky? Some of the images aren’t as clear in this smaller version of the photo, and maybe it’s just me seeing what I want to see, pulling extra meaning out of what should be “meaningless.” But if it gives me hope and reassurance (and isn’t hurting anyone), let me continue to see my son—and his heavenly friends—in the clouds. Oh Crystal how awesome is that! I love it! Thank you, Jess. I’m glad you are seeing your Iris in all things. The winks from my babies help me stay connected and bring me comfort. These cloud pictures are amazing! I love them and all the meanings behind them. I’m so behind on blog reading & I just read your last several posts. Sorry I’m so behind – I haven’t been trying to ignore you. Thank you, dear. There are so many blogs and so many new ones (so heartbreaking), so I understand. You’re right, regrets won’t change the past. I so wish the hospital had let you hold your baby–how glorious that will be in heaven! Collecting mementos for my babies (including your beautiful scrapbook tags) do help me feel more connected to them.